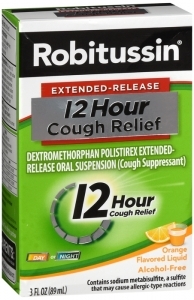 Get fast, effective cough relief any time of day with this non-drowsy cough medicine for adults and children 4 years and older. Shake bottle well before use. Measure only with dosing cup provided. Do not use dosing cup with other products. Dose as follows or as directed by doctor. ml = milliliter. Adults and Children 12 Years of Age and Over: 10 ml every 12 hours, not to exceed 20 ml in 24 hours. Children 6 to Under 12 Years of Age: 5 ml every 12 hours, not to exceed 10 ml in 24 hours. Children 4 to Under 6 Years of Age: 2.5 ml every 12 hours, not to exceed 5 ml in 24 hours. Children Under 4 Years of Age: Do not use.Uses: Temporarily relieves: cough due to minor throat and bronchial irritation as may occur with the common cold or inhaled irritants; the impulse to cough to help you get to sleep. Active Ingredients: In Each 5 ml: Dextromethorphan Polistirex Equivalent to 30 mg Dextromethorphan Hydrobromide, USP. Purpose: Cough Suppressant. Inactive Ingredients: D&C Red 30, D&C Yellow 10, Flavor, Glycerin, High Fructose Corn Syrup, Methylparaben, Polysorbate 80, Polyvinyl Acetate, Povidone, Propylparaben, Purified Water, Sodium Metabisulfite, Sodium Polystyrene Sulfonate, Sucrose, Tartaric Acid, Tragacanth Gum, Triacetin, Xanthan Gum.